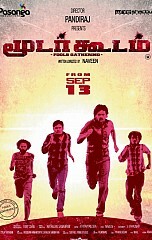 மூடர் கூடம், a film directed by a newcomer Naveen, produced by Pasanga fame Pandiraj. It casts mostly newcomers. Jaya Prakash and Oviya are the few known faces in the movie and the director also acted in this movie. Film is of genre dark comedy following the success of Soodhu Kavvum, Neram, etc. The film is about four youngsters or fools (Director, Sendrayan, White, Kuberan), among them only one is educated (the director). They happened to meet each other in a police station and join together. No one has any job or any proper home so decided to do a robbery at White's uncle's house itself when he left for a trip with his family. They end up in the house when everyone was present, they house arrest them. And, what happens next, did they get any money, did they get caught, forms the story. The film is slow, silly and may test your patience at times. The three guys always do some foolish things which irritates Naveen are good fun like Sendrayan getting monkey cap instead of a Mask, other guy Kuberan who leaves the arrested people unattended to have lunch, etc. Naveen has done an excellent job both in direction and acting, especially the dialogues. Most of the dialogues are really good and funny. Sendrayan as Sendrayan, really done his role well and who makes mistakes in all his tasks. Everyone in this movie has a flashback, the four guys, a dog and even for a doll, but each one was unique with a song, which is more like a bgm. The songs used are funny rhymes, Bharathiar song and an old song remix. The doll really plays an important role at the end. One of the flashback was shown in animation which was nicely done, but the dog's flashback was little boring, gone overboard. Every flashback comes at a different point not in any order, which actually tells the reason for that character's particular action like why Sendrayan punishing everyone by asking them to stand upside down, why Naveen gave the money to a poor mom for her daughter's operation, why White let Oviya marry his lover and leave the home. The reasons are actually explained in the short flashback along with their story. On the downside the film is little too big, and the flashbacks keep on coming even towards the end and some unfunny moments inside the house which should have been trimmed since most of movie revolves inside the house itself. And, also too many dialogues on rich and poor trying to justify all those who are rich are bad people. Still Naveen has many interesting things like Dawood's Chennai branch. Jayaprakash's young girl falling for the leader of the group Naveen, there is another thief who doesn't know to read English and speaks about Job Ethics and a small girl who tortures Jayaprakash in the phone. So, Moodar Koodam is a really good attempt from Naveen. May not be received well by all, but definitely a must watch for those who enjoy a different kind of movie. This page has information about Most underrated Movie of 2013, Moodar Koodam, Oviya.